“I always thought car-driving was reserved for the well-learned people only but now, I don’t think so,” says Nancy. 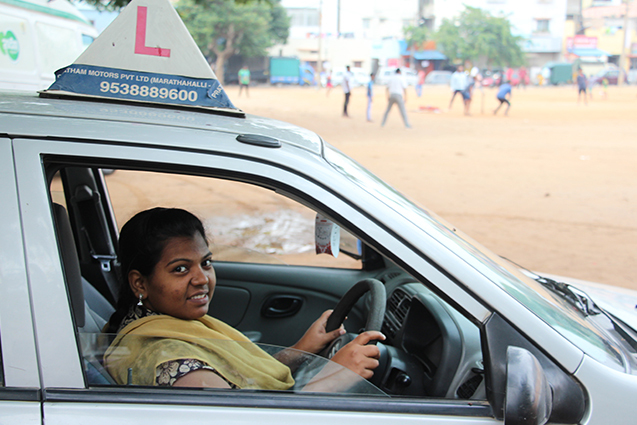 Nancy is one of 16 women learning cab-driving in Bengaluru, facilitated by our Karnataka Regional Office. Our Rajasthan Regional Office is also running a similar initiative in Jaipur; 24 women are getting trained in cab-driving there. These training programmes are supported by DXC Technology and are designed to train 60 women in total, 30 each from Bengaluru and Jaipur. This is part of a larger programme aimed towards empowering young women from vulnerable communities to break gender stereotypes and socio-economic barriers through vocational skill training. The employees of DXC Technology are also playing an active role by listening to, encouraging and also mentoring these trainees to overcome all barriers. These women have taken up the driving seat, which a few weeks back was unimaginable! We are proud of them as they stand up for themselves and for the women in their communities, challenging stereotypes and breaking barriers.